Radial migration. The fact that neurons find their place in the cortex during development is nothing short of a miracle. Many neurons originate in the subventricular zone, i.e. the area lining the ventricles. During brain development, these neurons subsequently climb outwards to their final positions using radial glia cells as scaffolds. If this delicate process is disturbed, neurons may be misplaced. Periventricular nodular heterotopia (PVNH) is a condition in which defects in neuronal migration result in ectopic neuronal nodules lining the ventricles. These nodules may result in a broad range of epilepsies, ranging from mild seizure disorders to intractable epilepsy with intellectual disability. Many cases of PVNH are assumed to be genetic, and FLNA and ARFGEF2 as known causative genes. However, the cause remains unknown in a significant number of patients. In a recent paper in Brain, C6orf70 is identified as a new candidate for PVNH using a clever combination of array CGH and exome sequencing. Brain malformations. The developing brain is particularly vulnerable to disruption through genetic or environmental effects. Accordingly, various disruptions occurring at different points in time can result in a broad range of developmental brain malformations. The current classification distinguishes between malformations due to abnormal proliferation, migration or organization of neurons in the developing cortex. For example, hemimegalencephaly may be due to abnormal proliferation of neurons caused by somatic mutations in the mTOR pathway. These defects in proliferation usually occur at a relatively early phase of brain development. In contrast polymicrogyria, the occurrence of multiple, small gyri in particular parts of the cortex, is the result of a defect in cortical organization, a process that normally occurs much later during brain development. Neuronal migration defects, caused by defects in physiological mechanisms that help neurons find their place in the cortex, happen at an intermediate stage. Periventricular nodular heterotopia (PVNH) is a typical neuronal migration defect. PVNH and epilepsy. Even though PVNH may appear very subtle on MRI, this brain malformation is usually associated with epilepsy, even though a clear correlation between number of nodules and severity of the seizure disorder may not be present. The periventricular nodules are usually highly interconnected in neuronal networks and may even participate in physiological functions in the brain. When PVNH occurs bilaterally, a genetic cause is usually assumed. Mutations in FLNA, coding for Filamin A, and ARFGEF2, coding for the ADP-ribosylation factor guanine nucleotide-exchange factor-2 are known genetic causes of PVNH. In addition, PVNH may be a recurrent finding in several genetic syndromes, often associated with additional developmental brain malformations and intellectual disability. For example, van Maldergem syndrome is a malformation syndrome usually associated with PVNH. Mutations in DCHS1 or FAT4, coding for two proteins involved in neuronal migration, were recently identified to cause this syndrome. Furthermore, PVNH is a recurrent, but sometimes inconsistent, finding in terminal deletions of chromosome 6q. In a recent study in Brain, Conti and collaborators zoom in on the critical region for PVNH and identify a plausible candidate gene. The discovery of C6orf70. Terminal and subterminal deletions of chromosome 6q come in different sizes and positions. Accordingly, overlapping regions for a particular phenotypic feature can be used to delineate a critical region. Conti and collaborators assessed the extent of the deletion in 12 patients with terminal or subterminal deletions of chromosome 6q. Even though all patients had various developmental brain malformations, only 9/12 patients had PVNH. Nevertheless, four patients with a relatively small deletion and PVNH helped delineate a critical region of 1.2 Mb, harboring six genes. Three of these genes were expressed in the developing brain. In order to identify the causative gene, Conti and collaborators subsequently used exome sequencing and functional studies. Performing exome sequencing in 14 patients with isolated PVNH, they identified one patient with a de novo mutation in C6orf70, one of the three genes in the critical region expressed in the brain. The gene name already indicates that little is known about its role. Therefore, the authors investigated the function of this gene during development of the rat brain. Silencing C6orf70 led to PVNH, providing further support for the hypothesis that this gene is mainly responsible for this brain malformation in terminal 6q deletions. A different kind of complexity. The study by Conti and collaborators provides an interesting template on how to disentangle the phenotypic and genetic complexity in malformation syndromes including the availability of small cohorts with overlapping and non-overlapping features. Classically, delineation of critical regions for deletion syndromes requires a particular feature to be present in all patients. 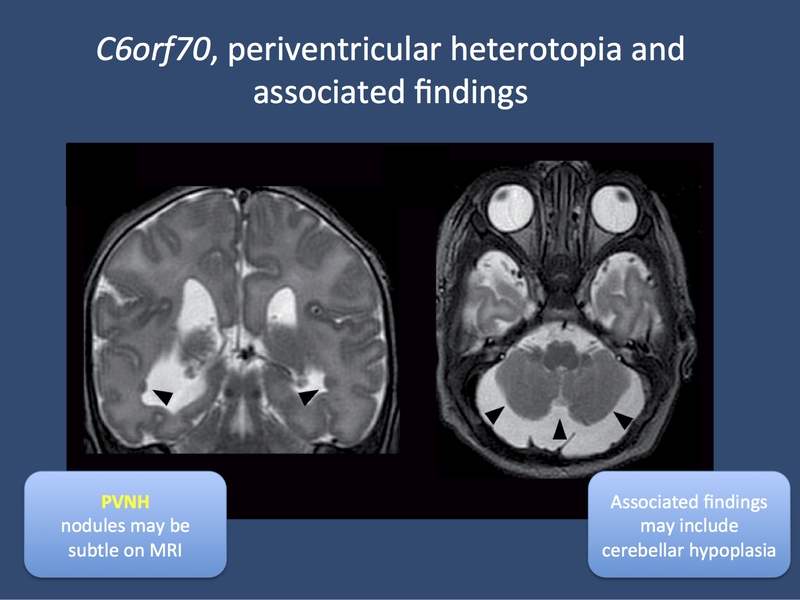 However, Conti and collaborators also identified three patients with brain malformations other that PVNH, indicating possible phenotypic heterogeneity of C6orf70 haploinsufficiency, possibly in the setting of more global dysregulation of brain development in larger deletions. In addition, high throughput sequencing helped pinpoint particular genes within a target region, and functional studies finally delivered a functional proof. This sequence of genetic analysis steps followed by functional studies may be an interesting strategy to identify candidate genes in other chromosomal disorders associated with epilepsy. This entry was posted in 2013, Bioinformatics, Brain malformations, Epileptic encephalopathy, Papers and tagged 6q terminal deletions, ARFGEF2, brain development, Brain malformations, C6orf70, cerebellar atrophy, critical region, epileptic encephalopathy, FLNA, lissenencephaly, microdeletion, neuronal migration, periventricular heterotopia, polymicrogyria, radial glia, subventricular zone, whole exome sequencing. Bookmark the permalink.